November 21, 2013 /0 Comments/in Athlete's Foot /by Jenn F.
What Are The Best Socks For Sweaty Feet & Athlete’s Foot Prevention? There are many sock brands advertising “sweat-wicking” and “breathable” material. Some brands even boast the “latest high-tech” solutions to sweaty feet and athlete’s foot. We’ve expressed some skepticism in the past regarding this new trend of “antimicrobial” socks because the claims are untested at best. However, there are plenty of socks on the market that are perfectly safe and will do a reasonable job at keeping your feet relatively dry. 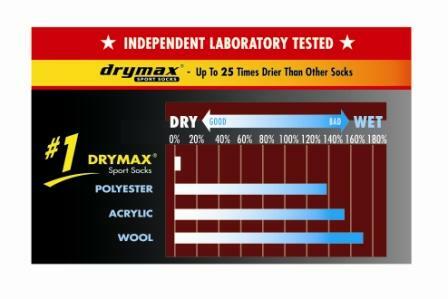 – Drymax: This has been the go-to brand for hyperhidrosis sufferers for years. Their unique moisture removal system uses two different fibers to keep moisture away from the skin. They have socks for all different sports and uses. Most sell for around $10 a pair on Amazon. – Thorlo: Thorlo socks focus on fit, padding, and moisture control. They are made with a special type of moisture-wicking acrylic. Though they are a few dollars pricier than Drymax ($13-$16), the Coolmax technology keeps your feet dry, while the stretchy nylon arch keeps your feet comfortable. – Atlas: Brand-new Atlas socks are manufactured using carbonized coffee to eliminate odors. Pressure mapping ensures a comfortable fit and a sock that doesn’t bunch or slide around a lot on your feet. One Forbes writer wore these socks for a week and still did not have foot odor! Buy them for $18 here. The AAPSM says that “the mechanical structure of the fiber and compressibility of the fiber will determine overall wicking potential.” Here is one mantra to repeat aloud: Cotton is NOT our friend. Materials like cotton and wool compress more easily than synthetic acrylic and CoolMax fibers, so they tend to swell more and cause the feet to overheat. The best-to-worst moisture-wicking socks are: CoolMax, acrylic, polypropylene, wool, and then cotton. Studies also show that cotton socks tend to bunch, cause more blisters, and become abrasive on the skin after multiple washes. In addition to wearing sweatproof socks, you’ll also want shoes that breathe. Look for full-grain leather and runners with mesh upper soles, rather than plastic, canvas, or nylon shoes. If you feel your feet become damp during the day, bring a spare pair to change into about midway through your work day. The wetter your feet are, the more “food” bacteria and fungus will have to feast upon — and nothing stinks like feasting fungus! A hot, wet, microbial environment is precisely where athlete’s foot loves to grow. So podiatrists also recommend using the SteriShoe UV shoe sanitizer to kill the fungus and bacteria living in your footwear. When used daily, SteriShoe can help you keep athlete’s foot causing microbes at bay. 5 Worst Places To Be Caught With Foul Foot Odor… And How to Fix It! Are There Any Non-Drug Treatments For Toenail Fungus?